Well, for a moment there I was getting a bit worried that the 12 days of the 2015 Chasing Mailboxes Errandonnee Challenge was slipping away and I was running dangerously low on completed errands. And then one simple errand led to a massive five in one day and one more the following day. AND I’m one step closer to getting over not being allowed to have a Krampus (yet) (again). 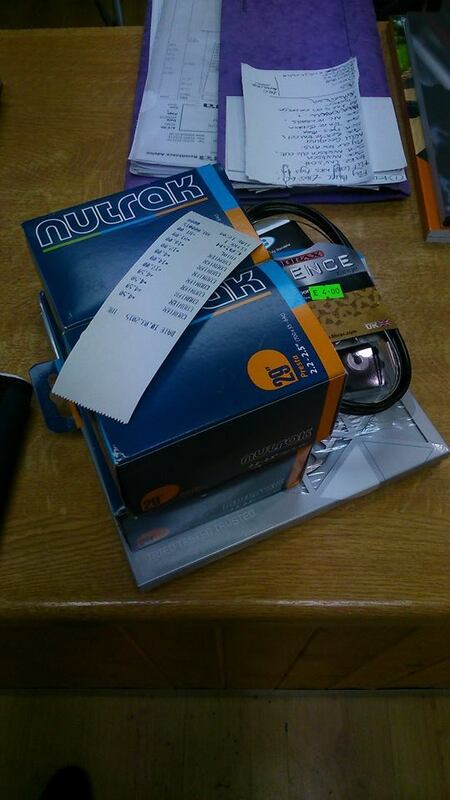 Errand #4: Picking up new shiny from the bike shop | Date: 10 March 2015 | Category: personal business (getting over the whole Krampus thing) | Miles: 12 | Thing I noticed: that doesn’t look like £80 worth of gear, but it is. The new shiny in question was: 4 new tubes, a gear cable, some jockey wheels, a chain and 2 disc brake rotors. The plan being to convert my Surly Ogre from its current setup as foul weather commuter and dedicated coffeeneuring rig to a fully rigid, knobbly tyred, lightweight (as lightweight as Surlys get, anyway) 29er mountain bike. Basically, convert it into the closest thing I can get to a Krampus with the meager budget I’m allowing myself to splurge on bikes at the moment. Errand #5: Surly Ogre MTB shakedown ride, part one | Date: 11 March 2015 | Category: wild card | Miles: 15 (combined for errands # 5 – 9) | Thing I noticed: I’m too fat to ride a 1×9 setup where 39:36 is the lowest gear ratio available to me. Errand #6: Showing off the Ogre to my bike shop friends | Date: 11 March 2015 | Category: social call | Miles: 0 | Thing I noticed: The Ogre now weighs (only) ~17kg. There’s no picture because I’m sure you’re sick of seeing my bike at the shop! Errand #7: Getting money out of the cashpoint so I could pay back the tenner I owed Karen | Date: 11 March 2015 | Category: non-store errand | Miles: 0 | Thing I noticed: I still can’t work a cashpoint with gloves on (I seem to remember noticing this last year too). There’s no picture because there was a queue of people behind me waiting to use the one working machine and I suspect they’d have beaten me if I stopped to take a photo. Errand #8: Buying some white spirit so I can clean paintbrushes and thin down the yacht varnish I’m using for the new garage door frame (how rock & roll is my life?) | Date: 11 March 2015 | Category: store | Miles: 0 | Thing I noticed: One does not simply walk into the store and just buy some white spirit – there must’ve been 20 different options! I went with the one that I felt struck the best balance between value for money and ability to fit in my Carradice saddle bag. 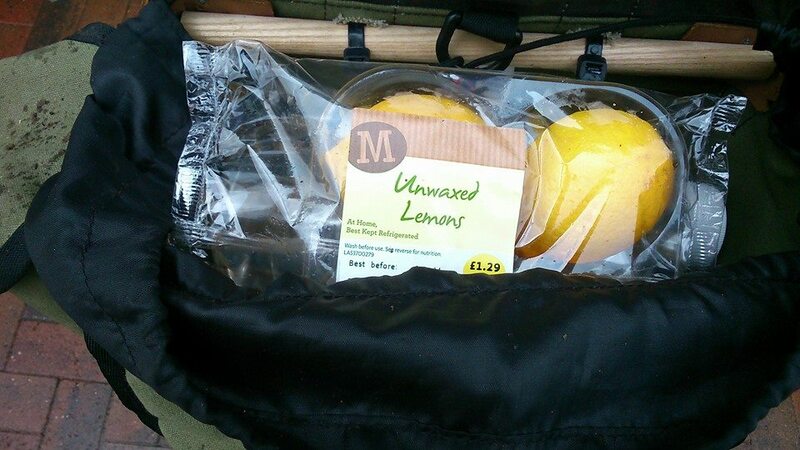 Errand #9: Picking up some lemons for Karen to make Lemon Drizzle cake with | Date: 11 March 2015 | Category: store | Miles: 0 | Thing I noticed: People look at me like I’m crazy when I take pictures of lemons and, to quote my friend Tess, the white spirit and the lemons “is gonna make a helluva martini”. Overall, the shakedown went well and all I really needed to do was adjust the angle of the handlebars slightly and think seriously about the gearing. 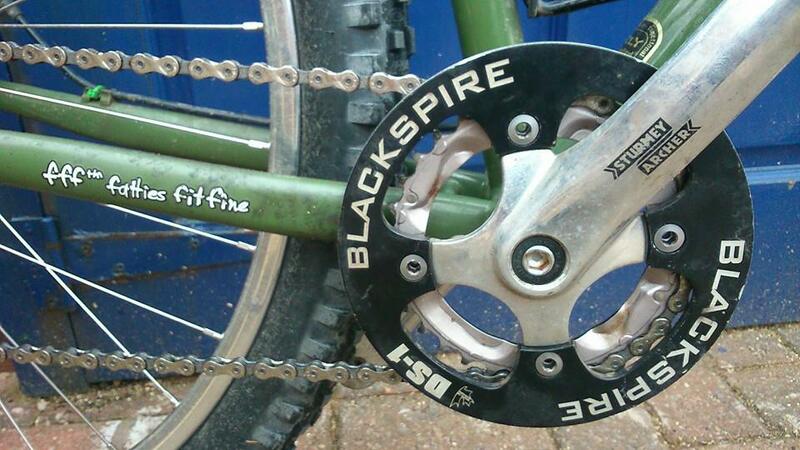 I’d originally planned to put a standard MTB triple on the front but then I got to thinking about whether I really need a big ring and settled on a double with bash ring. Then I thought: hang on a minute, I’ve already got a single ring with bash fitted to the Ogre… maybe I can just run that as a 1×9 with a 12:36 cassette. As it turns out though, the 39 tooth chainring I had on there (which I’d wrongly thought was 36 tooth) was just way too tall for the kind of riding I want to do and even on the flat I wasn’t using the high gears so a smaller chainring was in order. After rummaging in the parts box, I found a 32 tooth middle ring on an old Shimano chainset so I threw that on and headed out for a quick spin to the shops. It’s a shame I’ve already used up my 2 store errands, but there you go. Errand #10: Surly Ogre MTB shakedown ride, part deux | Date: 12 March 2015 | Category: personal care (because leaving the old gearing on there would’ve killed me). Miles: 1.5. Thing I noticed: the gearing was so high before because what I thought was a 36t chainring was *actually* a 39t chainring! This 32t ring is *much* more sensible. 4 full days to go and only 2 more errands to complete! How are you getting on? We’ve all been there, the dreaded last orders bell ringing and the bar staff impatiently looking at the full pint of beer in your hand, wanting to clean up and go home. And, all you want is for the night to never end. And so it has been with the 2014 Chasing Mailboxes Coffeeneuring Challenge. Somehow, it’s already weekend 7 of 7, MG is ringing the bell for last orders and all I want is for the challenge to never end. 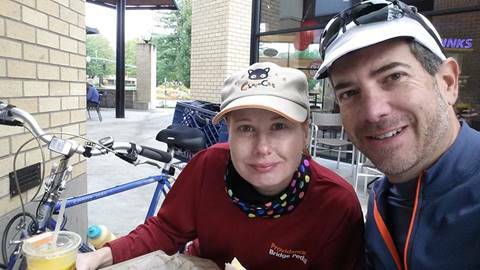 This is the first time I’ve taken part in the coffeeneuring challenge and I must admit, after the first ride, I wasn’t really getting it… It felt weird to just go for a short, slow ride and randomly stop somewhere for a cup of coffee. But, as the challenge went on and I found myself visiting some great local places (and one not so great place), I started to appreciate the simple pleasures of enjoying others’ company and the different perspective you get on your local area when you actually take the time to stop and smell the flowers. 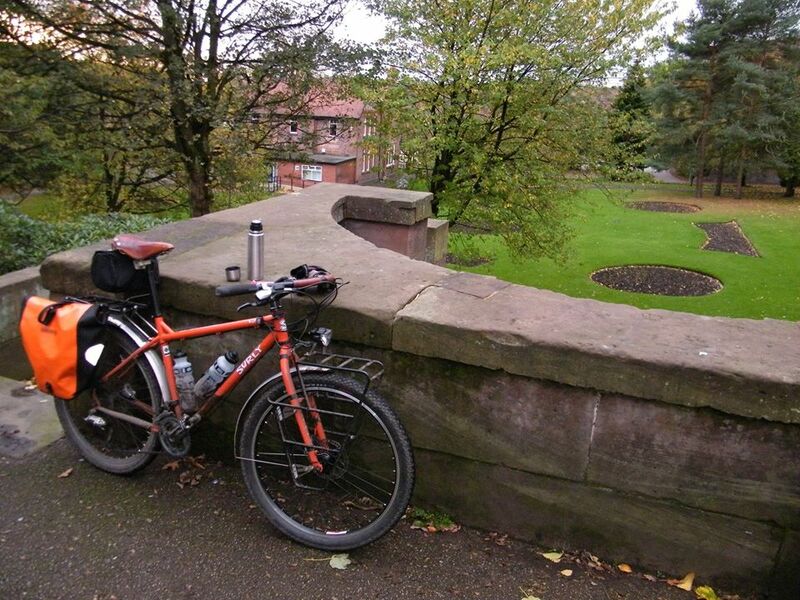 Whilst the challenge may be over, my coffeeneuring adventures are only just beginning. 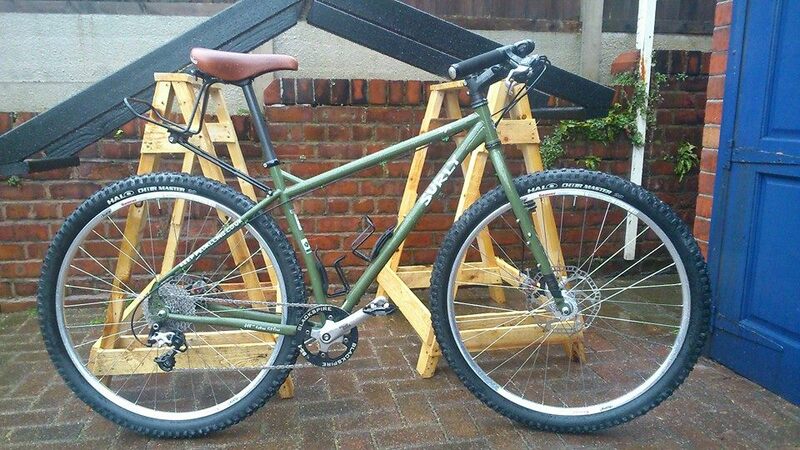 Hell, I’ve even decided to keep my Surly Ogre in its current cafe racer style as my dedicated coffeeneuring steed. Where I went: Once again, I joined forces with fellow blogger and part-time coffeneurer, the Northern Walker. 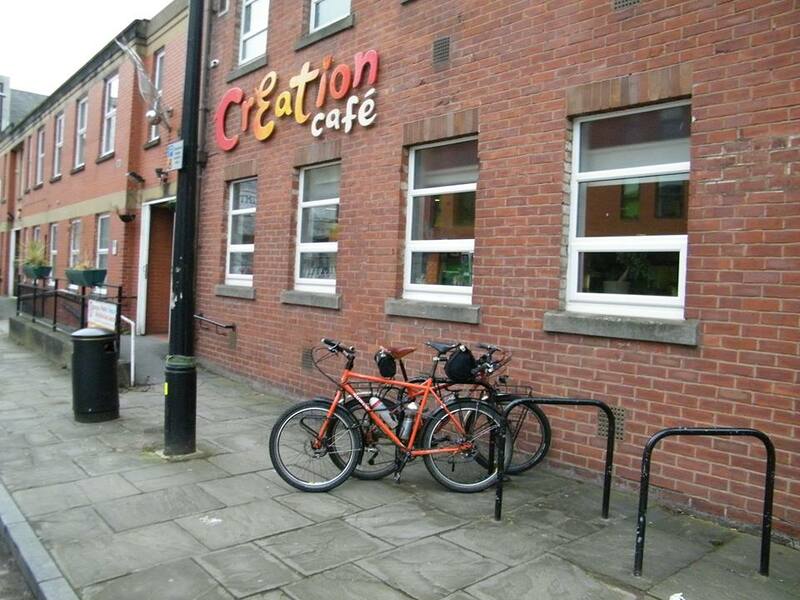 We met up at the bike shop before heading over to Creation Cafe, 1 St. Phillips Place, Salford, M3 6FA. Date I went there: Saturday 15th November 2014. 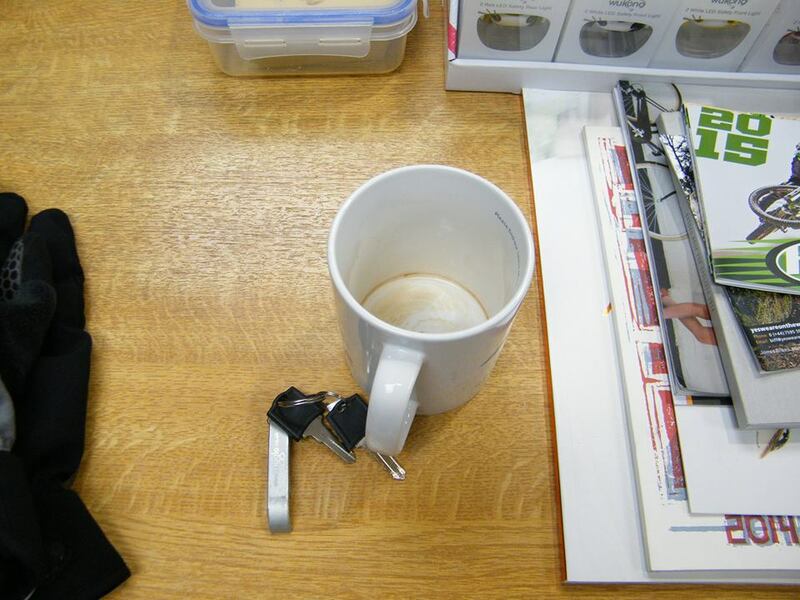 What I drank: I had a large mocha which was great and some kind of crunchy cereal bar which was rubbish. Matt had a large black coffee which was reportedly excellent. We both loved the mugs! A detail or two about my coffeeneuring ride: The A-board on the street advertised Creation Cafe as “open ’til late” so, as we arrived around 15:30, we were somewhat confused to find the place completely empty (and blurry in this picture) and, as much as we were welcomed, I got the distinct impression that the guy wanted to close up and go home… which we were preventing him from doing. Matt didn’t seem bothered by this but I must say I was slightly put off by it. Bike friendliness of the locale: I’m most pleased to report that there are actual public bicycle racks right outside the cafe so which we shackled our pair of Surly Trolls. You can’t see the bikes when you’re inside the place though so if you’re particularly paranoid, you might feel uncomfortable about leaving it unattended out there. Mileage: A short one today – by this point, I’d only ridden about 8 miles (Matt had been out all morning) but I went on to ride about another 20 afterwards. Must visit: This is a tricky one… the place is nice, the coffee is good (and fairly priced) but I can’t shake the negative feeling I got from the luke-warm welcome and empty cake display. I’ll probably go back again but I expect something better next time. Week #6 of the 2014 Chasing Mailboxes Coffeeneuring Challenge is upon us and I’m right on schedule, having bagged a very wet ride #6 this Saturday. I was once again joined by our friend of Northern Walker fame and, given the unmitigated disaster that was his choice of coffee shop on our last ride together, he insisted I choose the location this time. “No pressure, then…?” I joked. We met at our favourite bike shop, Keep Pedalling in Manchester (other inferior bike shops are available) where we spent some time nattering about bikes and drooling over a brand new Tangerine Dream Surly Crosscheck being picked up. Whilst I was there, they recommended a new coffee place that has recently opened up on the other side of the city; we set out riding in no particular direction as the first few spots of rain landed on the lenses of my glasses. We rode north on NCN route 66 along the Rochdale canal until we reached Middleton then looped through Heaton Park into Prestwich and down towards Pendelbury before heading back into the city along the banks of the River Irwell – if you know the area, this can be a pleasant route but it was pouring rain for the entire ride and, by the time we reached Greengate Square in Salford, every single item of clothing we had on was soaked through. 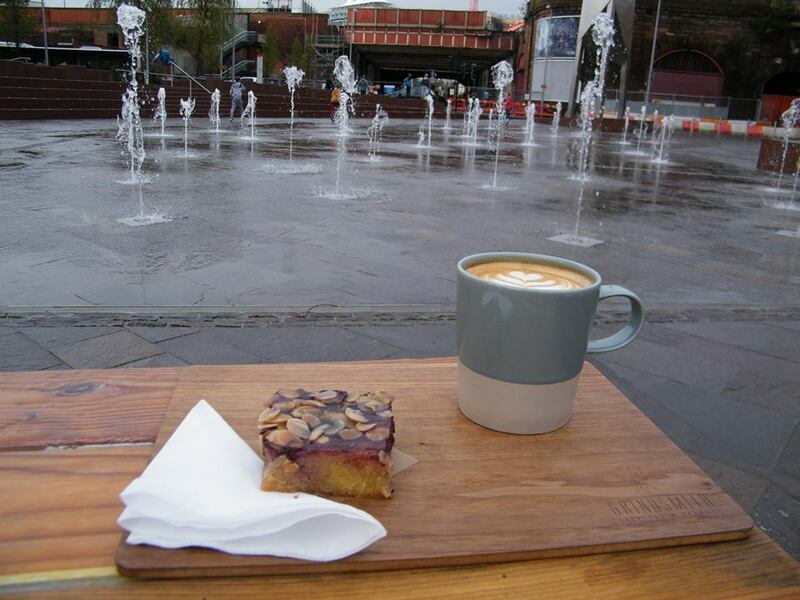 Where I went: Grindsmith Espresso & Brewbar, Greengate Square, Victoria Bridge Street, Manchester, UK, M3 5AS. Date I went there: Saturday 8th November 2014. What I drank: Standing there, dripping on the floor with my glasses steaming up, I asked what they might recommend for a freezing cold, soaking wet cyclist, especially as I couldn’t read the menu. “Cappuccino” was the response and, despite me not really liking any cappuccino I’ve had in the past, I went with it anyway. 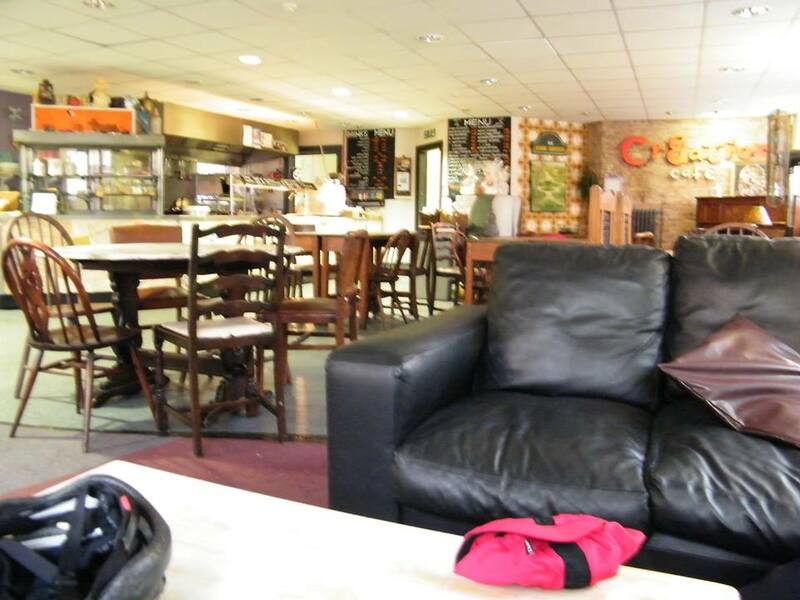 The friendly staff invited us to take a seat in the nice warm interior which, whilst incredibly tempting, would’ve resulted in us getting mud all over everything so we declined, deciding to sit outside as the rain had finally eased off. 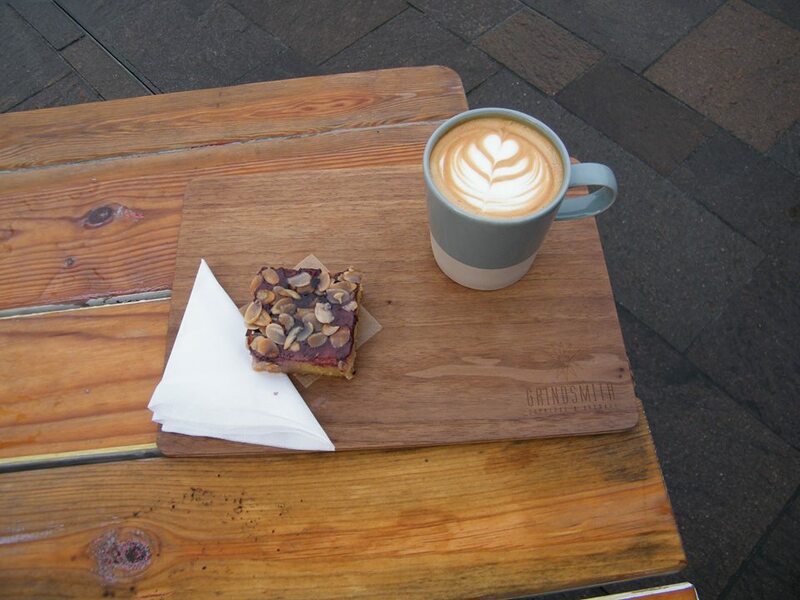 A detail or two about my coffeeneuring ride: Along with my cappuccino I ordered a bakewell slice which was lovingly presented to me on a custom made wooden plank – fancy, eh? Despite my previous forays into the world of cappuccino drinking, I’m pleased to say what I had was really quite pleasant; it’ll never be my favourite coffee but it was nice all the same. The bakewell slice was ooey-gooey and easily lived up to its billing as being “spectacular”. Bike friendliness of the locale: Finally, FINALLY! A place with bike racks! As per bleeding usual, there wasn’t a single public bike rack anywhere in sight but the good folks at Grindsmith had solved this problem by simply bolting one to the side of the place! There’s even a vintage chopper there to reinforce the hipster vibe (happily, there’s no requirement to wear tight trousers and a checked shirt or have a carefully trimmed beard). Mileage: As usual, we didn’t keep track but it was probably somewhere between 30 and 40. In. The. Pouring. Rain. Must visit: As I say, there’s a definite hipster vibe here, what with the old cable reels and wooden crates to sit on, the trendy people coming and going, extravagantly swiping their iPhones (other, non-knobbish mobile phones ARE available) and, with 2 coffees and 2 small pieces of cake costing over a tenner, it’s hardly cheap but the surroundings are lovely, the staff are friendly and welcoming and the quality of the product commands the price tag. Oh, and we didn’t feel out of place at all, despite my dishevelled appearance of which I am so proud. We enjoyed our coffees as we sat watching the strangely relaxing fountains dance. Later on, we childishly zig-zagged our way through the fountains on our bikes, much to our own soggy amusement. I’ve got a list of jobs to do as long as my arm. And, I’ve got long arms. So, when an exhausted Karen fell asleep on the couch this Saturday I was faced with a dilemma: do I risk waking her up by getting the vacuum out or by putting the washing machine on? Being the problem solver I am, I decided to let her get some much needed rest, tiptoed out to the garage and snuck off on the bike for a bit of coffeeneuring. I expect my ‘Boyfriend of the year’ award is in the post. 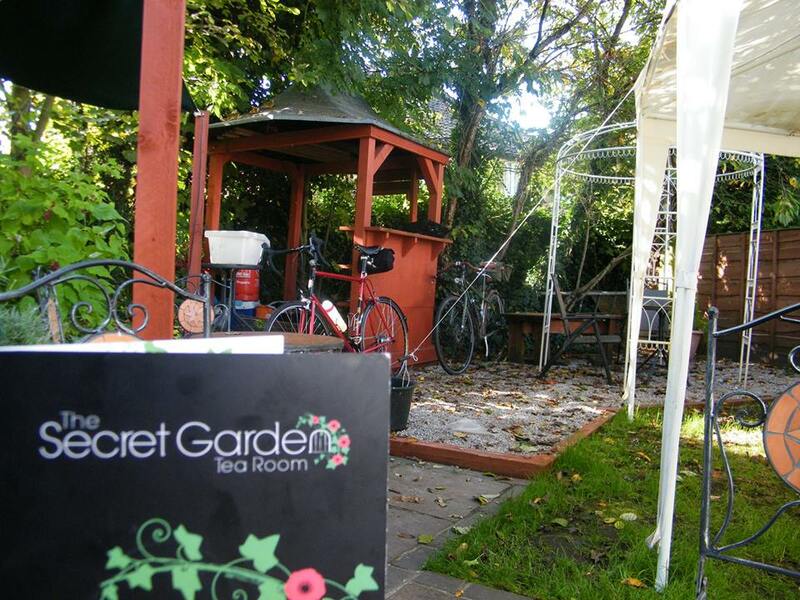 Where I went: For coffeeneuring ride #5, I went with another coffee shop sans walls in the shape of Jubilee Park in Middleton, North Manchester. Date I went there: Saturday 27th October 2014. 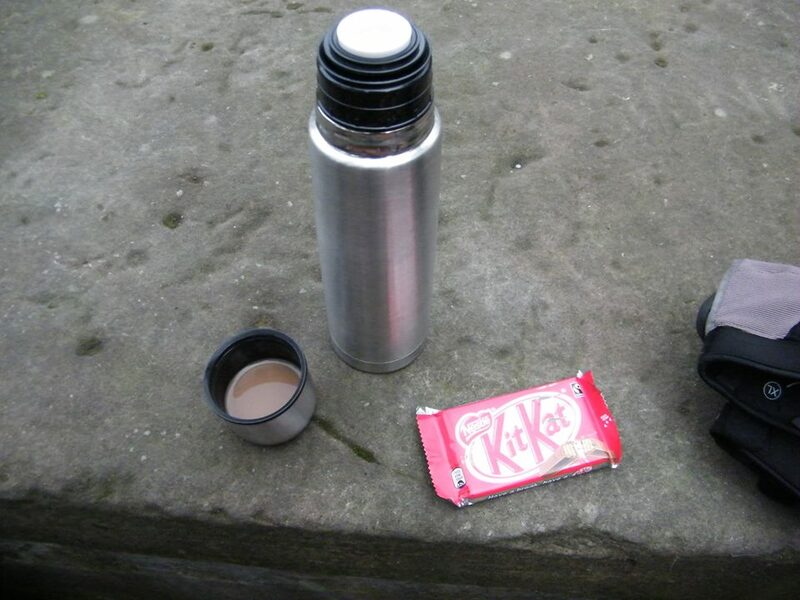 What I drank: Nothing terribly exciting, just a small flask of strong, sweet coffee. Oh, and I grabbed a KitKat on my way out. A detail or two about my coffeeneuring ride: So far, almost all of my coffeeneuring rides have followed a theme of having no predetermined destination and no sense of direction. This weekend’s ride was no exception. I went down the road to drop off a parcel, turned around, rode up the hill a bit, changed my mind, turned left, changed my mind again, explored a trail I’ve been meaning to ride down for months, found it went nowhere, turned around, rode through the park a bit, changed my mind, rode around the park a bit more, rode down the river for a few miles, rode into the city centre (on a Saturday evening! ), rode along the canal for about an hour and then finally settled on a spot in a surprisingly nice little park. I found myself a good spot where I could lean the bike, sit on the wall, drink my coffee, eat my KitKat and wonder why nobody else was out enjoying the park. Bike friendliness of the locale: Well, like all public places in the UK, there was the usual lack of ANYTHING to lock one’s bike to and, as I rode down the hill out of the park, I was surprised by the lack of smooth ramps – naturally, I just rode down the steps. Must visit: Yes. Well, it’s not necessary for you to visit Jubilee Park (although you can if you wish), but I am highly recommending you head out to your local park and just sit, enjoying a coffee and the quiet… until your phone rings and you have to sheepishly explain where you’ve escaped to. 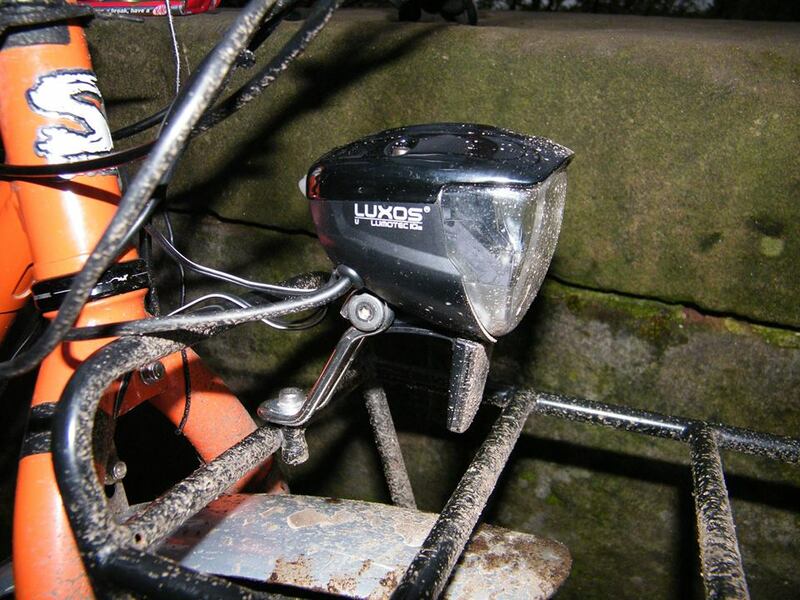 Oh, by the way, I’ve recently been testing out my awesome new Luxos front light… more on that soon. If you tuned in for the 100th post here at lifeinthecyclelane, or indeed, you followed my progress in the 2014 Errandonnee challenge, you’ll know that rule bending is commonplace. Heck, it’s almost encouraged. And so it was with my dubious 4th entry into the 2014 Chasing Mailboxes Coffeeneuring Challenge. 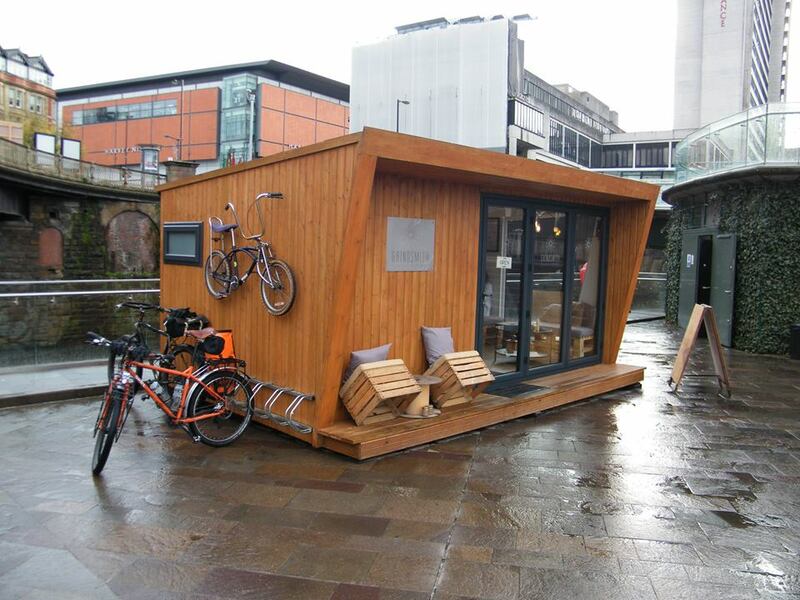 Where I went: Coffee shop without walls (sort of): Keep Pedalling, 23 Hilton Street, Manchester, M1 1EL. Date I went there: Tuesday 21st October 2014. What I drank: Shona made me a cup of Earl Grey tea which I had with a couple of Reese’s Peanut Butter Cups. 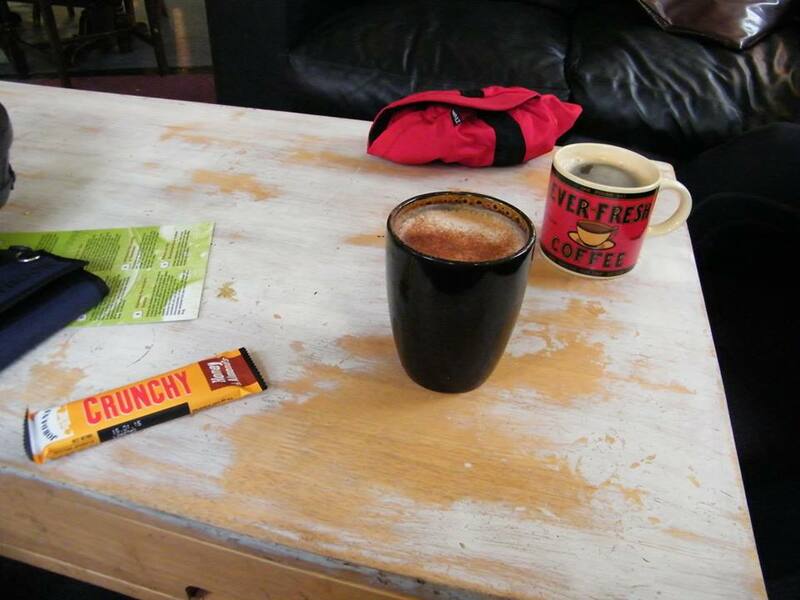 A detail or two about my coffeeneuring ride: Well, I guess this is where I explain the flimsy rationale behind my rule bending… You see, this past weekend I had all kinds of evil plans to escape for 2 days of cycling and, of course, coffeeneuring. Alas, I was discovered and instead spent all of Saturday selling cake before delivering an engagement party cake in the evening (and spending time at the party). Sunday was largely taken up with chores and cleaning. Happily enough, I’d booked Monday & Tuesday off work so technically these 2 days count as my weekend, right? RIGHT? Again, Monday was swallowed up by chores but today I finally managed to escape on the bike. By pure coincidence, my friends who run the bike shop had asked whether I’d pop in and countersign a passport application for them. So, I headed off and battled the remains of Hurricane Gonzalo which is currently battering the UK. Despite its immense weight, even my Surly Troll struggled to stay upright in the relentless crosswinds; the axle deep flooding along the riverbank proved to be no challenge at all, however. I made it to the shop unscathed and dutifully filled in the endless forms in my capacity as “an upstanding member of the community” (!) and enjoyed a cup of Earl Grey tea with a couple of Reese’s Peanut Butter cups. So, whilst technically neither an actual coffee shop or a coffee shop without walls, or even an actual weekend day, I reckon it still counts. Just. Oh, and surely I get extra points for going out in a hurricane. Bike friendliness of the locale: As you’d expect from a bike shop, it scores very highly here – there are racks right outside to lock your bike to and there’s always someone to chat to about bikes, gear and other such nonsense. Mileage: As is the way of things, I didn’t keep track but it was at least 12 for the round trip. Must visit? : But, of course. However, I can’t guarantee you’ll get a cuppa! Well, here it is folks. My 100th post on this blog. If you’ve stuck around from the very beginning or you’re one of my more recent followers, I’d like to say a huge thank you (or should that be sorry?) for taking the time to read this drivel. So, what does one do at such a milestone? I suppose I could do one of those cheesy reviews looking back at some of my favourite posts, quote some stats and show you the most looked at pictures, maybe even revisit some of the gems from ‘Random stuff people were searching for when they landed here trivia!’… but, no. For my 100th post, I have something a little bit special for you. A post that has literally been years in the making. 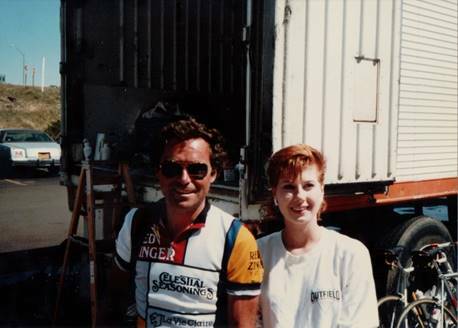 It’s got a little bit of everything: nostalgia, celebrities, old bikes, new bikes, some guy called “Tim” (whoever he is), and even a little bit of Coffeeneuring. I know what you’re thinking: there’s just no way anything I wrote could contain so much awesome and, you’re right. That’s why I’ve brought in a guest blogger to pen this, the 100th (and probably best) post on lifeinthecyclelane. I grew up in a family of cyclists. Two older brothers rode – one of them even made it to the US Junior Nationals one year — and eventually my dad got into it too. RAGBRAI is a family tradition. My dad rode it into his mid-60’s at least. My whole family (including my husband) have ridden it together multiple times as a vacation. I refuse to go — I think it sounds like a penance. I can think of better things to do in a Midwestern July than cycling hundreds of miles in 110% humidity past endless fields of soybeans, showering out of a plastic bag, and sleeping on the ground. When I was in high school, my brother and my dad had the local bike shop build me a bike, but I never really joined the cult. There was a definite vibe that there was a right way to do it, and anything else was wrong. I knew I couldn’t do it right (that’s older brothers for you) and so I just… didn’t do it. But I kept that bike. For thirty years, I took it with me. And occasionally, I rode it. A Panasonic Sport 1000 frame and probably a lot of crap components. I took it to Minerva, Ohio, and leaned it against my apartment wall. One of the few pictures I have of my very first cat, Koshka, was of him climbing on that bike. I took it to Dallas, Texas, where I pretty much didn’t ride it at all, because Dallas is not built for cycling, and Texas is too damned hot for anything. 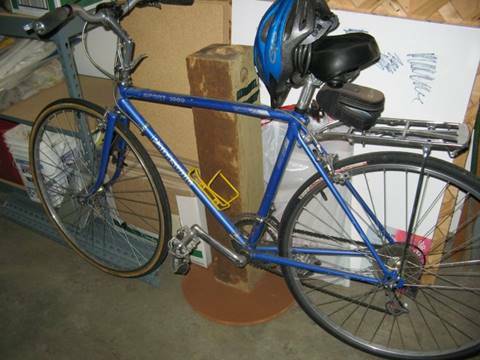 And I took it to Portland, Oregon, with my husband, who one year started riding it to work. And rode it to the coast with a group of friends. And rode it in his first century. And oh yes – the cult was back. The padded shorts, the shoes with clips. Oh. My. God. Here we go again. He bought his own bike; then another. And eventually a third, and sold the first, and a parade of bike parts and bike clothes and bike gear passed through the house and down to the man cave, and a repair station was built and bike stands installed. And my old bike just sat there. But. It turns out that Portland has a way of soothing those old wounds inflicted by that Midwestern, you’re-not-good-enough way of thinking. 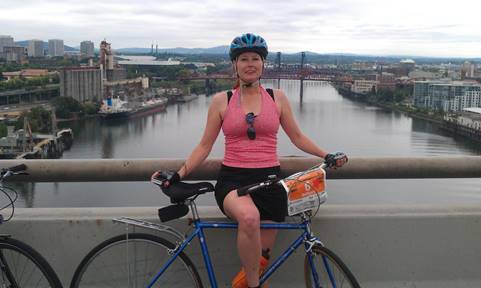 Portland doesn’t care if you have the “right” cycling gear. Hell, Portland doesn’t care if you wear clothes. Slowly, I began to re-think. Maybe I could do this. Last year, an online friend came for a visit in August and wanted to do a lot of hiking. To get myself in shape for that, I started riding a few times a week. 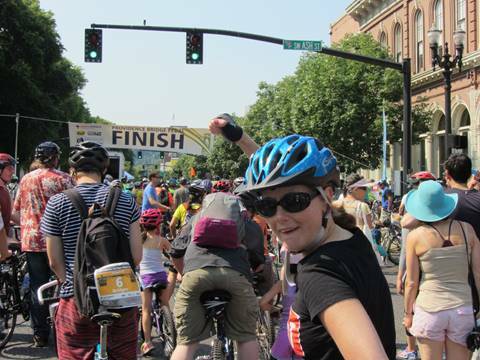 Then I found out that she would be here for the Portland Bridge Pedal. I’m not entirely sure what made me do it, but I threw the suggestion out there and YES WE DID. My first ever organized ride. And I wore a pink top with sparkly sequins on it. And oh man, was it FUN. Last spring, my online friend Tim told me about Chasing Mailboxes’ Errandonée Challenge, and while I didn’t really do it, the idea stuck with me. 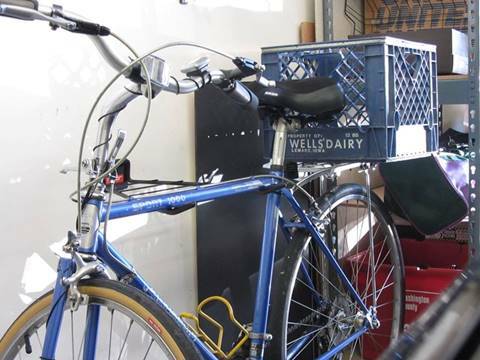 I put an old milk crate (of the same vintage and from a nearby town) on the back of the old bike, and one day in April I RODE TO THE LIBRARY TO RETURN A BOOK. Holy crap! I CAN DO THIS! And it’s… kind of FUN! 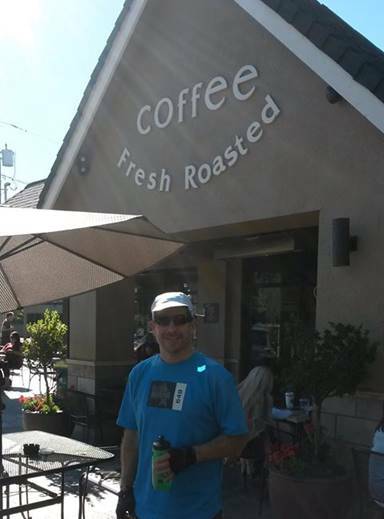 Now (thanks to Tim of course), we are Coffeeneuring! In fellowship with cyclists all over the world. And guess what? IT’S FUN! Husband is riding a Renovo, handmade right here in PDX. Out of wood. Week 2: I blew it by drinking orange juice instead of something hot with caffeine. Oh, well, I say it counts. THIS IS PORTLAND. Rules are flexible. So. Two weekends down, and after this weekend, we will be attempting to Coffeeneur in Europe for the next two weeks. If you’d ever told me I would be wanting to cycle on a trip to Europe, I’d have said you were higher than a kite. But I am looking forward to it. Maybe it’s not what my brothers would call “real” cycling, but this time, I’m doing it my own way. And guess what… IT’S FUN. And there you have it, riding your bike is fun. Who knew? 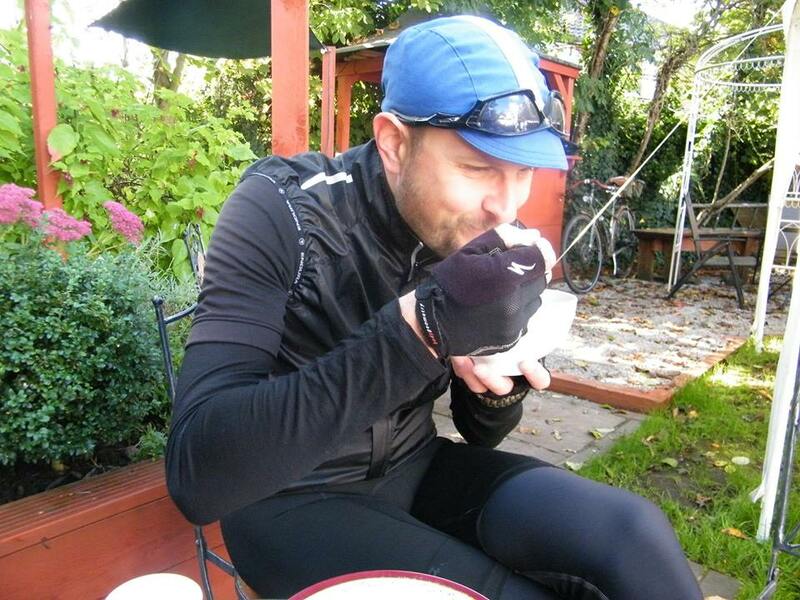 HUGE thanks to Tess for the guest post and sorry to MG for the flagrant bending of the coffeeneuring rules! Luckily enough, there wasn’t much traffic on the streets when I set out for a ride this morning in thick fog. 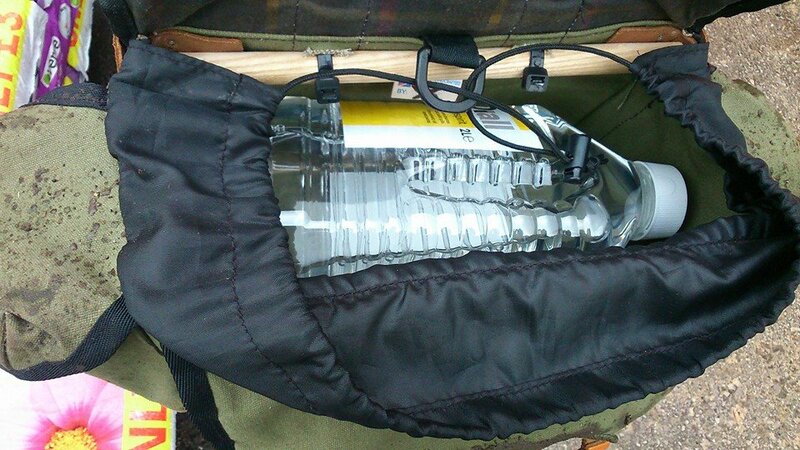 Through a slightly dangerous combination of peering over my glasses and through the layer of condensation that built up immediately, I did manage to spot quite a large number of cyclists out there… I’m fairly sure I even saw a tandem at one point. By the time I arrived in the city centre, I’d managed to clear my lenses enough to make out the shivering figure of my friend who’d decided that short finger gloves and a lightweight jacket would be sufficient to keep him warm on this chilly October morning. Wardrobe choice was not the only mistake he made… but we’ll come back to that a little later. If you’re a follower of the Northern Walker, you’ll know he’s recently finished building up a rather beautiful new road bike so we spent some time drooling over the details, discussing tube size and other such important matters before he had a quick spin to test out my cafe racer bars on the Ogre and eventually we set off in search of Coffeeneuring based adventure. Pootling out of Manchester City Centre, we set off down Oxford Road in the general direction of Didsbury and The Art of Tea which Matt had recommended after reading good things about on t’ interweb. I was excited. The ride down there was great, we continued chatting about nonsense and Matt got all nostalgic about how the place had changed since he’d lived there some years ago… something about “Ey, when I were a lad, it were all fields ’round ‘ere!” and “Ah, good to see Akbar’s is still there…” as we rolled through Kebab Alley. 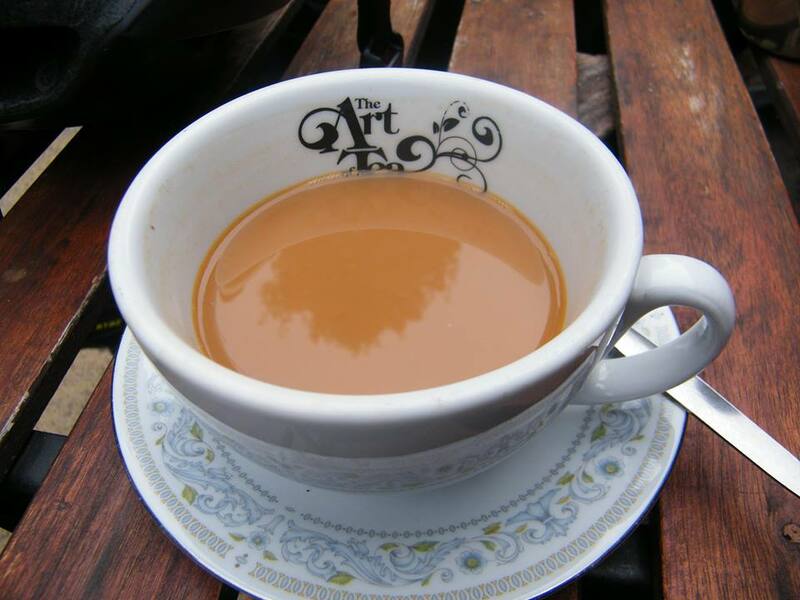 Where I went: The Art of Tea, 47 Barlow Moor Road, Didsbury, Manchester, M20 6TW. Date I went there: Sunday 12th October 2014. What I drank: We both had white coffee which I ordered alongside a couple of simple toasted teacakes. A detail or two about my coffeeneuring ride: The coffee arrived after a short delay but there was no sign of teacakes. As time went by and we drank the coffee cups dry, still no teacakes. By which point we accepted the fact we’d been largely forgotten about, despite there being a sum total of 4 (count ’em, 4) other customers in the entire place. When I went in to pay, I was told by one of the 2 waiting staff (that’s 3 customers or 1.5 tables per member of staff) that the chef was “having a crisis” and asked whether I still wanted my teacakes. I did not. I spent a penny before leaving and cut my finger on the broken hot water tap… what a shambles. There are some simple basics I expect: if your so-called-chef is having a meltdown because he either can’t find the teackes, can’t get them out of the packet or can’t work the toaster, TELL ME. If something is damaged (and clearly has been for a long time) and is likely to cause injury to your customers, FIX IT. I’m sorry to say that you got the basics all kinds of wrong today, Art of Tea. And, because of that, I’ll NEVER be coming back again. Bike friendliness of the locale: Again, The Art of Tea scores extremely poorly here. 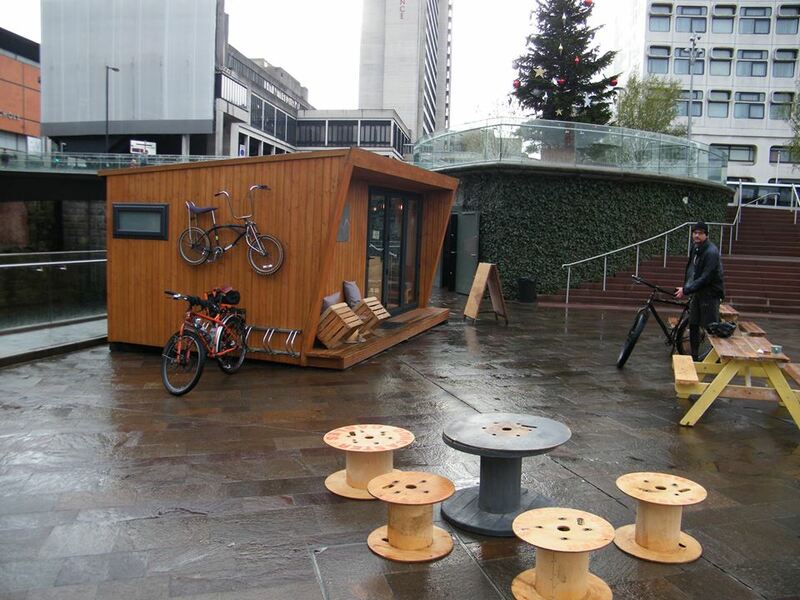 Not a single bike rack in sight and outside tables crammed in so much that there’s nowhere there to leave your bike. Being a Sunday, the shop next door was closed so we leaned our bikes there and kept a close eye out. Mileage: Up to this point, around 12ish probably. Must visit? : For all the reasons above, and despite the clear potential of the place, I have no option but to recommend you don’t even bother going there in the first place, let alone going back time and again. Well, with that unpleasantness out of the way, we set off in search of more adventure and somehow ended up heading back the way we came and then going on a bit of a tour around Eccles, Monton, Worsley, Swinton and a few other places. What I drank: This time we ordered tea for 2 which arrived in rather dainty little bone china cups and a bowl of asparagus soup each. 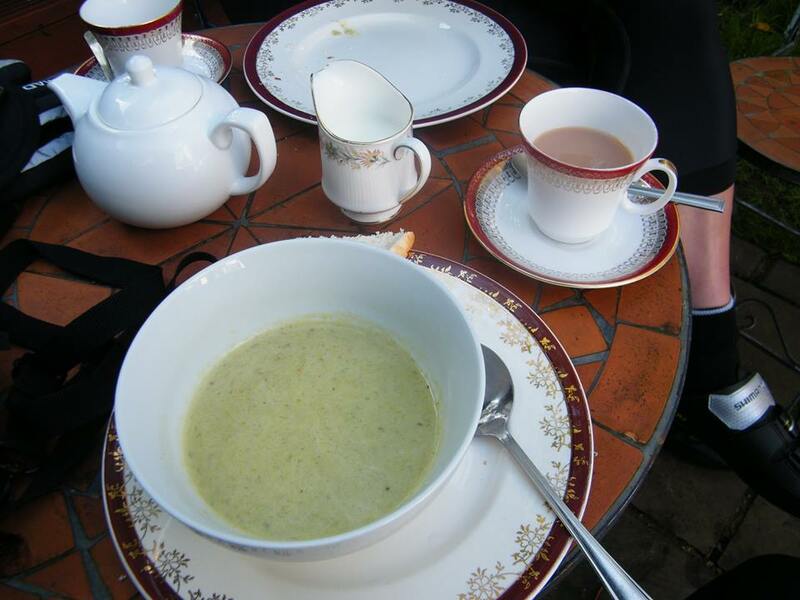 A detail or two about my coffeeneuring ride: Asparagus soup is DELICIOUS! Service was quick, friendly and efficient. Surroundings were very pleasant and I could’ve quite easily sat there all day. 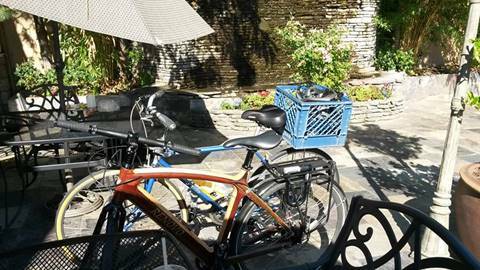 Bike friendliness of the locale: We just piled into the place with our bikes and leant them against the gazebo in the corner – nobody batted an eyelid. Oh, and they didn’t seem to mind us nomming our soup like we hadn’t eaten in 2 days either. Mileage: By this point (we continued riding for a while after this), probably about 20. Must visit? : Oh hell yes. Get yourself down there RIGHT NOW.